Call us today for dog daycare services! 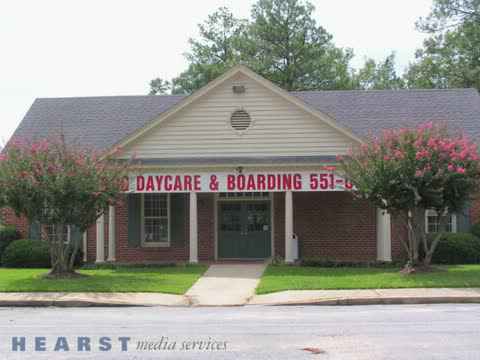 When you are looking for a dog daycare in the Columbia, SC area, you can count on A Paw's Paradise! We are the premier pet resort in the area since 2005. Offering overnight stay, full day play, and weekend hours, you can't go wrong when you bring your furry friend to A Paw's Paradise! Any sensible and happy dog parent in Columbia, SC knows that they can rely on A Paw's Paradise as a safe and friendly dog boarding facility. We know that most people consider their animals as extended family members, and we do too! Our animal-lover staff will assure that your four-legged friend stays happy and leaves happy after their stay! Unlike most dog daycare services in Columbia, SC, we offer a full day of open-area, supervised group play as opposed to kenneling with intermittent walks. On our indoor, rubber-floored play area, your dog can safely run and play with other guests or nap on the couches depending on their preference. Similarly, our large outdoor fenced yard is the perfect place for games of fetch and chase or for a relaxing nap in the sun. Why choose A Paw’s Paradise dog daycare and dog boarding in Columbia, SC for your pet? Not all dogs know how to be a dog! A Paws Paradise gives dogs a chance to improve their social skills through supervised play and interactions with other dogs. In addition to providing quality dog boarding services, we'll give your pup enough to do so they are well exercised and well behaved when they return home! Most behavioral problems result from a lack of exercise or activity, which isn't a problem for our dog daycare! We'll be sure to tire them out by the end of the day. A happily tired dog will be less likely to bark, chew and dig while at home. The Ultimate Pet Resort for Your Canine! Most people are tired after a long day of work and don’t always have the energy to wear out their energetic dog upon returning home. A Paws Paradise, our pet resort in Columbia, SC will send home a happy, exhausted dog whose energy level matches yours! You'll never have to worry about your pet being bored or cooped up at our dog boarding facility. There is plenty to do, plenty of friends to interact with, and plenty of time to expend all of their pent up energy! Your pet will certainly feel like they're on a pampered vacation! Not everyone has the time to go home and let their dogs out for exercise and potty breaks during a busy work day. A Paw’s Paradise has you covered with their professional services for your pet at our amazing pet resort. You’ll rest easy at work and running errands knowing your companion is having a safe, joyful day! While your pet is relaxing at our pet resort, we’ll be sure to handle all the dirty work for you as well. We will send your furry friend home fresh and clean from professional pet cleaning services. With a reliable and all-inclusive dog boarding facility like ours, you won't ever have to worry about your canine friend feeling lonely, or not being adequately taken care of while you are absent. Our staff of dedicated animal lovers will always show genuine compassion and care to our furry clients, and will respect your needs and wishes while they are boarding with us. Whether it be walking, exercise, or behavioral training that you need taken care of, we can help! Allow our dog daycare to meet your beloved pet! For the safety of all our guests all dogs accepted must be non-aggressive toward other dogs and people. We require all of our dog guests to be spayed or neutered if over seven months of age, have their vaccinations (DHLPP, Bordetella-Kennel Cough for all ages, and rabies of over 6 months). Tell your friends about our dog boarding in Columbia, SC and you will receive one free day of daycare for your dog with each new referral! First time boarders receive 25% off their bill! Below you will find information regarding the services we offer. At A Paw's Paradise, we strive to provide the finest in dog daycare and dog boarding services to the Columbia, SC area, at affordable prices. You’ll have peace of mind knowing that your pet is enjoying an impeccably clean, caring and secure home-away-from-home under the watchful eyes of our experienced staff. All dog boarding accommodations are spacious, climate controlled, and designed for the comfort and safety of your pet. Discounted activity packages are available to provide your dog with our most popular services. Most importantly, your pet will receive plenty of love while you’re away. Visit us for convenient dog boarding services in the Columbia, SC area. Make our dog boarding services comfortable for your dog. We ask that you bring food, although we can supply food at $2 per day for a dog up to 30 pounds. We also ask that you bring forms, vaccination records, medications, and special things from home to make the dog boarding experience a positive one. We do not allow rawhides or tennis balls for safety reasons. Choose the Ultimate Pet Resort in the Area! Whether you are looking for dog boarding for your upcoming vacation or would like to treat your furry friend to a day at a pet resort, be sure to contact A Paw's Paradise today! Our caring staff is proud to offer some of the best dog daycare services in the Columbia, SC area! Contact us today for more information or to book time with us! Our dog daycare facility offers pet boarding for dogs. We have supervised group play all day long, an indoor and outdoor play area, dog bath stations, and more. Overnight boarding is available as well as daily boarding.